It’s been quite a while since I last posted, and there are a couple of reasons. First, I have been very busy—ports every day, and tours almost every port. Plus, the lectures required a lot of additional prep, since I just got this assignment after I left home in March. 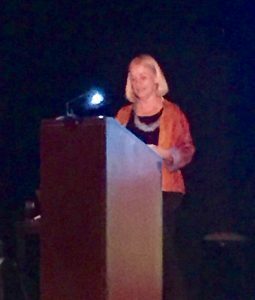 I had to develop talks on eight Baltic ports while on earlier cruises or the breaks in between, and they were not really as polished as I was comfortable with sometimes until the day I gave them—one such talk pictured, rather blurry, here. And then there’s the fun onboard stuff—I am on a great trivia team, have had excellent dinner company every night, and had fun the other day being one of the liars in Liar’s Club. I had particular fun with the word “ prickmadam” ( look it up) , claiming it was an Elizabethan term for a transvestite, and making up a quotation saying that one character in Shakespeare was said to be “so void of common wit he would chase a prickmadam to unskirt.” Sounds pretty good, huh? I told the truth with “gyrovagus,” making up a story about retarded medieval monks. Great fun, and we liars were so good about half the audience got all of them wrong, and the best anyone did was 50 percent. And too busy to observe much of any value to share. I am flying home in a few days for a three-week hiatus in San Diego, and as I start thinking about going home, with most of the work and play done, I will make some observations about how My Year of Living Travelly looks at the four-month mark, but for now, time for coffee and the NYT crossword. Think later.